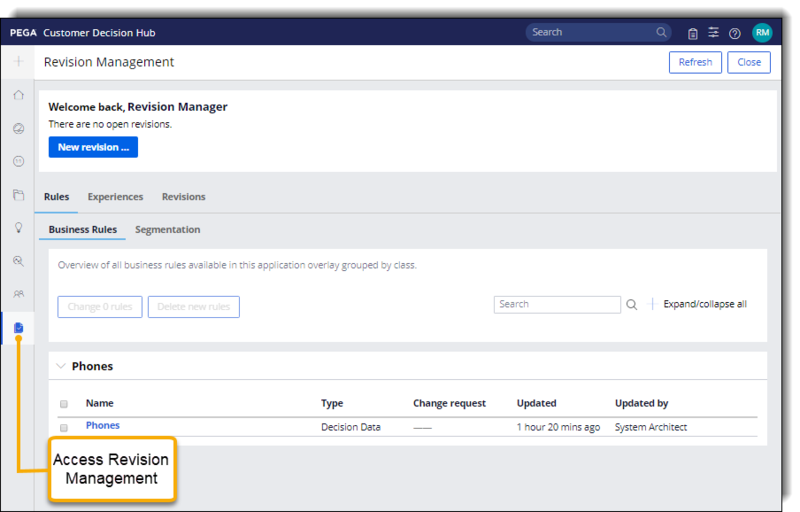 Use the revision management functionality of Pega™ Customer Decision Hub to allow business users to adjust enterprise applications to ever-changing business requirements. Introducing and managing adjustments directly in the production environment demands substantial IT involvement and is often time-consuming. With revision management, business users can make changes to applications within the confines that the IT (for example, system architect) set for them. After making a change, business users can audit and test that update before it is deployed in the production environment. This tutorial provides a basic use case to get you started with revision management. For more information, see Applying revision management of decisioning rules. uPlusTelco wants to modify the price of one of their products. As the revision manager, define a change request and assign it to the strategy designer. The strategy designer can address the change request by modifying the Price parameter of a proposition. Create a business hierarchy of propositions that represents products to offer to your customers. For more information, see: Creating a business hierarchy of propositions. Build an application overlay to select rules to undergo revision management. For more information, see Revision Management landing page. As part of an application overlay, you also create access groups for business users who can update business rules, for example, the revision manager who initiates and approves rule changes and the strategy designer who updates the rules and submits them for the revision manager's approval. Revision is a case type that initiates the process of changing business rules. You can create revisions if your user account has the <Your_App_Name>RevisionManager access group associated with it. For detailed steps, see Creating revisions. A revision consists of one or more change requests. The change request is a sub-case of revision. As a revision manager, you can assign change requests to business users who perform the requested changes, such as creating new rules or modifying the existing ones. After completing a change request, the assignee can submit the change request for the revision manager's approval. For detailed steps, see Completing change requests. When all change requests that comprise a revision are complete, the revision manager can submit the revision and create a .jar file that contains the updated rules. The system architect can import that file into the enterprise application for testing and activation. For detailed steps, see Resolving revisions. By using revision management, you responded to changing requirements by modifying your application’s rules in a controlled manner. You created a revision and change requests that define the scope of updates to business rules. You completed the assigned work and submitted your updates for approval.